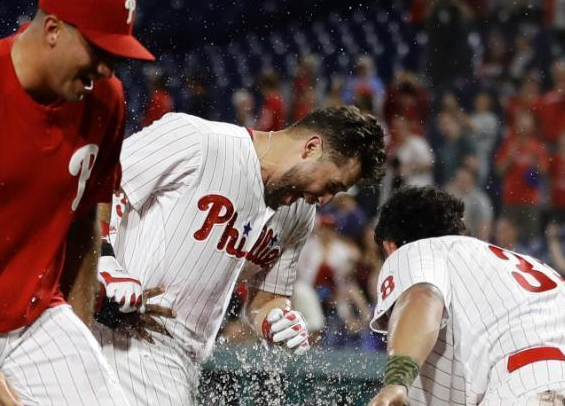 With a single swing of the bat just after 1 a.m. Trevor Plouffe capped off nearly six hours of baseball at Citizens Bank Park with a walk-off three-run homer to lift the Phillies past the Dodgers, 7-4. The game lasted 16 innings, the Phillies matching the Dodgers blow for blow as the lead in the NL East now sits at a full game. "We felt like that game was worth going all-in for," Phillies manager Gabe Kapler said afterward (see video). "Every game is, but certainly when you come back like we did, you reward your guys by fighting with them by saying, 'This game means everything to us.' So, that's how we approached it." The Dodgers carried a 4-1 lead into the seventh until Maikel Franco delivered an RBI-double and Jorge Alfaro drilled a two-run home run into the Dodgers' bullpen to even the contest. It remained deadlocked unto the 16th when Plouffe hit his three-run bomb off Dodgers infielder Enrique Hernandez who was asked to pitch after the club had already used seven relievers. Aaron Nola started on the hill for the Phillies, but he wasn't his normal dominant self and struggled to get through five innings, surrendering three runs on five hits. The bullpen, however, was exceptional tossing 11 innings while surrendering just one run. Starter Vince Velasquez came on in relief in the 16th and despite allowing a hit and a walk he was able to eliminate the threat and secure the win. Austin Davis pitched on a third consecutive day out of the Phillies bullpen, tossing two innings while collecting three strikeouts. "It was not one person individually," Kapler said of the effort. "It was the bullpen. It was the big hits. It was the fight. It was the tenacity. It was the grind. It was the drive. It was the character. Everybody sort of running for their opportunity to participate in that game. And just about everybody did." The two clubs conclude their three-game set Wednesday with a 12:35 pm.m contest at Citizens Bank Park. Jake Arrieta is set to start for the Phillies while the Dodgers counter with righty Walker Buehler.